Last year I saw an advert for a free professional face painting course run by my local Children's Centers. I jumped at the chance because I could see it being a really useful skill to bring to friend's parties and community events. I had a brilliant time doing the course and it turned out to be more useful than I could have imagined because I got recruited at the end of the course to become a Children's Center volunteer. A year on from the course and I have painted on quite literally hundreds of children and adults, including my own long-suffering husband who gets volunteered to be my practice face on a regular basis. 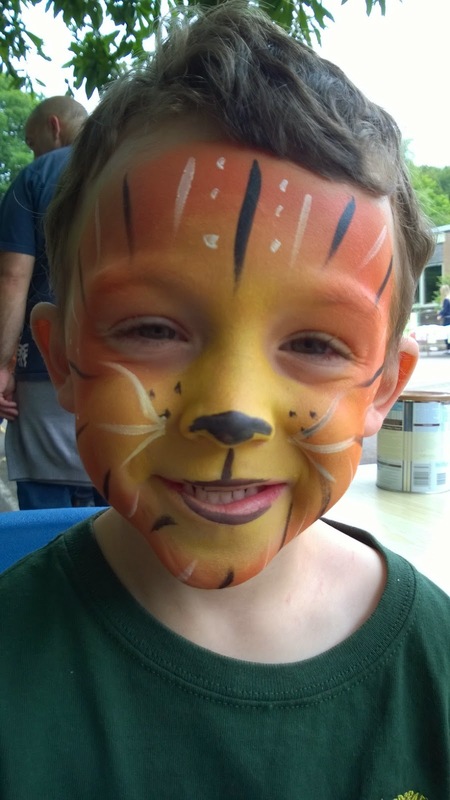 He is also absolutely essential in my ability to offer my face painting to help at parties and events because he is the one chasing our boys around and trying to keep them out of trouble while they're full of party food and adrenaline. I don't post a lot about the face painting, even though it can take over at least of part of most weekends. This isn't through any lack of enthusiasm - just lack of photos since I don't take pictures of the kids I paint on - mainly for safeguarding reasons as I don't think it's the done thing these days - but also because at a normal event I spend the whole session glued to a chair painting constantly without a chance to take a slurp of water, never mind a photo. This picture is a rare one then - Ollie was my first customer at a local school fete where I was painting to raise funds for them (over £30 in two hours). I love it when he does want to be painted because it breaks the ice and once one person has had it done, all the other kids flock in. It's funny though that my own kids are often the only ones without any paint on them at the end of the party - partly because it's no novelty to them, but also because Ollie loves a certain Superman costume and generally doesn't want his face painted while he's wearing it. Toby will only let me paint him if it's reciprocal and he's allowed to paint on me - fine at home maybe not when I'm in public. It might also strike people as strange that I don't face paint at our own parties, but painting takes me completely away from being able to do anything else and there's definitely not time to host the party and paint the guests. For this reason when friends ask me to teach them so they can do their own parties I always say "yes, ... but.. just shout and I'll come and paint" - I love to spread the things I've learned, but since my kit as it stands currently represents about £100 of paint, sponges, brushes and glitters (and a basic starter kit costs about £25), that's a lot for friends to lay out for a particular event when they will find out they can't use it because it's so time consuming. I'm not a registered face painter with liability insurance, so I just paint for free for friends or as a volunteer at events. So how do I pay for my kit? I sometimes get small donations from friends or event planners, which is totally voluntary and not a 'fee', and this is ploughed straight back into replacing used paints, expanding my colour pallet, buying a few select more expensive paints for line work, new sponges and brushes, and don't forget lots and lots of glitter gel. Maybe at some point I will go professional but I like the 'pay it forward' way I have of working as a volunteer - some folks give a little, most don't, but those that do pay for those that don't and in the meantime I get to help raise money for schools, help with groups events, provide entertainment for the public at big events, and best of all see my friends kids (and my own) with great big smiles on their faces.